Woman Paralyzed From the Shoulders Down Needs Help For therapy, cost of living, housing, modifications & travel expenses after extensive surgeries! Beth, or Bethany Cox, as you may know her, was severely injured as a passenger in a car accident at age 25. Among a long list of other severe injuries, her spinal cord injury combined with her brain injury turned what seemed to be unfathomable into her new reality: Bethany was a total-care quadriplegic. There was all the things “they” say. “She’ll never breathe on her own, eat, talk, move or feel anything below her neck, and even then she will not be able to turn her head.” Even though none of this turned out to be true (she talks nonstop, eats pretty much everything in site, has sensation everywhere, nerves and muscles firing throughout much of her body, most shockingly her legs!) But all of this doesn’t change the fact that she has zero capabilities to take care of herself in any capacity, due to her lack of hand and triceps functions, and the enormous amount of spasticity (Spasticity is a condition in which certain muscles are continuously contracted. This contraction causes stiffness or tightness of the muscles and can interfere with normal movement) mainly in her upper extremities. Bethany is upbeat, silly, positive, funny, and doesn’t get down very often about her circumstances because she is too interested in life! People, travel, music, food, books, politics, poetry & writing in general, spending time with her nieces & nephews, and planning for a better future are a few things that keep her mind off of the things she can’t do. She wrote an intimate, humorous, informative, no-bars-held blog, where several articles were shared among multiple websites and online magazines until the website she used was shut down. She is a gifted writer and has poems, several inspired by what happened to her, published in the first literary magazine she submitted them to. In 2014 & 2015, she entered a contest for a chance to have a personal photo shoot in her area, and was signed to two different agencies. Writing and modeling are two loves of hers that she plans on pursuing again, as well as a vlog on an upcoming YouTube channel. However great her outlook on life, the time for serious change that has been needed for years now, is starting to cause great distress and fear for her future, as we do not know who will be able to continue to care for her the rest of her life. If she doesn’t have the surgeries and, most importantly, the THERAPY after, it’s very likely Beth could end up with no choice but to live in a nursing home in a few years. Quadriplegics suffer from impairment of the arms and hands in varying degrees, with the hands being the most difficult aspect for most. 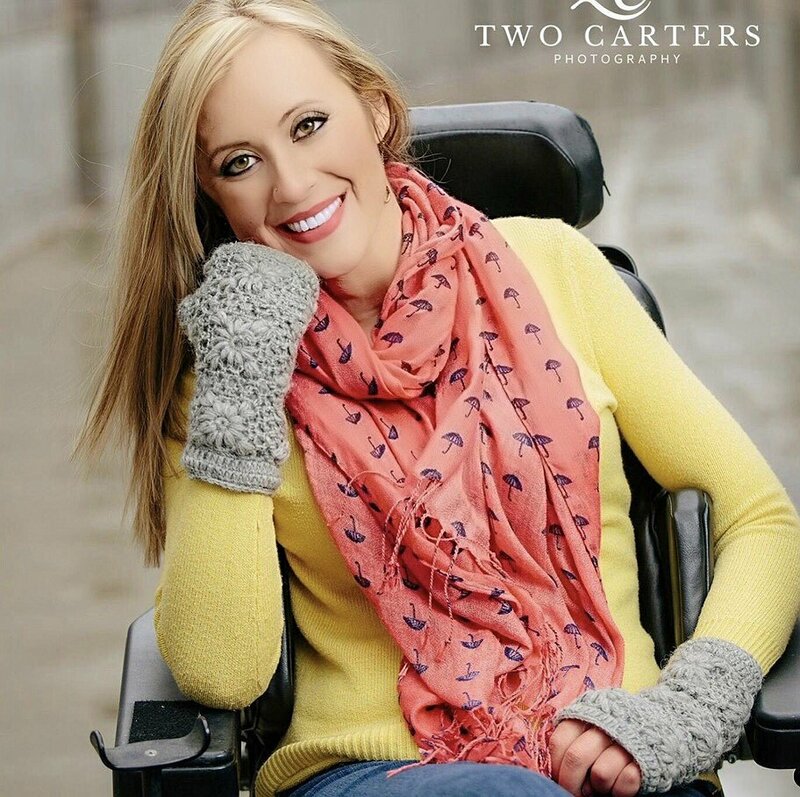 Beth’s triceps function is the lowest functioning muscle in her entire body and the level of impairment means she is incapable of being able to dress herself, transfer, drive, shower herself or even go to the bathroom without the complete assistance of others, and much more. She is completely dependent on others. As you can imagine, this total lack of independence is time-consuming, frustrating, depressing and expensive. Hiring an assistant outside of a company, which has become a necessity, costs between $15-$30 per hour. Her mother read an article speaking about nerve & tendon transfers for the arms and hands to restore function and independence. Beth and her family decided that the best choice for her particular situation is with a doctor and his team at The Shepherd Center in Atlanta, Georgia. The surgeon says her possibilities for recovery of function are, “ always unknown but at the same time, limitless. She is a perfect candidate.” He believes the surgeries could allow the hands to function at a level which could help her enough to where she might not need an aide/assistant for such invasive and everyday activities or less of a need for one. This procedure will be covered by insurance, for the most part. Having the surgeries is NOT an instant “fix.” Without therapy, which is not covered by ANY type of insurance, Medicaid or Medicare means that the cost for rehab and OT, not to mention the cost of living in Atlanta while all of this is going on, are astronomical, as I hope you can imagine. Therapy is $100 per hour, the cost of an apartment in the Atlanta area ranges from $1,200-$1,800 or more per month, not including essentials such as food and utilities. One of Beth’s biggest dream since her accident has been to attend Beyond Therapy at The Shepherd Center, an extensive, rigorous, activity-based center with some of the most knowledgeable, experienced trainers, state-of-the-art equipment, technology, and years of working with others with spinal cord and traumatic brain injuries. If she had the opportunity to go, who can even imagine the results she could have, especially considering her leg movement, what will be her “new” arms, and the training of her core? Please help this sweet girl. She has been through so much and is deserving of an opportunity for more recovery. And for those of you who have known for a long time, please don’t forget about her; remember that it wasn’t a one-time event that happened and she “got over it.” It is actually more important and crucial than any other time. We appreciate you taking the time to read this! Thank you for everyone who makes a donation! HELP WITH PLANNING EVENTS NEEDED! If contributing money isn’t an option right now or in the near future, Beth knows! And what we would love more than anything is some assistance to help us plan events. Beth is absolutely amazed and humbled by the kind people we know, and those we don’t, who have taken the time to contribute to this account! There are family members doing fundraising on their end, using their place of business and proceeds from sales, to raise money we couldn’t dream of! We know the goal of $100,000 is exceptionally high and seemingly impossible to raise. But we believe our God is greater and loves to show His power, mercy, and love to His children! Glad to be able to offer support! Beffers, I’d give you the world if I could my dearest friend. I have loved your spirit since the day I met you and you are always in my heart. I just love you. And I’m praying. Thank you for asking. It took courage, but you are loved by many. Praying for success.